To commemorate the achievements of Claude Elwood Shannon an endowed lectureship has been established at the University of California, San Diego. Each year an outstanding information theorist is selected to present the Shannon Memorial Lecture on or about Shannon's birthday (April 30th). 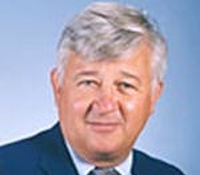 Richard E. Blahut received the BS degree in electrical engineering in 1960 from the Massachusetts Institute of Technology, Cambridge, MA, the MS degree in physics in 1964 from the Stevens Institute of Technology, Hoboken, New Jersey, and the PhD degree in electrical engineering in 1972 from Cornell University, Ithaca, New York. Dr. Blahut is the Henry Magnuski Professor and Head of the Department of Electrical and Computer Engineering at the University of Illinois and a Research Professor of the Coordinated Science Laboratory. His teaching and research are in the areas of communications, signal processing, imaging systems, coding theory, and optical recording. A major project of the past decade is his authorship of a series of advanced textbooks on the mathematical aspects of theoretical informatics including information theory, communications theory, surveillance theory, error-control codes, and signal processing. In 1980, he was named a Fellow of the IBM Corporation, in 1991 a Fellow of the Institute of Electrical and Electronics Engineers, and in 1990 was named a member of the National Academy of Engineering. He is a member of the IEEE, the American Association for the Advancement of Science, and a member of SIAM. He is the recipient of the 1998 IEEE Alexander Graham Bell Medal, and the 2005 Shannon Award from the IEEE Information Theory Society. He is a recipient of the IEEE Information Theory Group 1974 Paper Award. Co-sponsored by the Information Theory and Applications Center (http://ita.ucsd.edu) and the California Institute for Telecommunications and Information Technology (www.calit2.net).